The Greater Montreal Real Estate Board is leading an initiative among Quebec boards to present CREA with a common list of demands for changes. At stake is the future membership of the Quebec boards in the national association. If they decide to leave, the Quebec boards have until the end of September to inform CREA that their membership will not be renewed next year. Several working groups comprised of presidents and directors from the Quebec boards will come up with recommendations to present to CREA. Quebec has rules that are different than elsewhere and “we have to respond to those needs directly,” Juaneda says. Juaneda insists that the Montreal board doesn’t want to leave CREA at any price and notes that CREA offers a common national vision and government representation required by the industry. CREA also offers services that smaller boards can not provide to members. At its annual meeting in March, CREA approved a motion that allows Quebec members to continue to receive a dues credit for advertising for the next three years. The credit reflects the fact that French-language TV and radio advertising promoting real estate in Quebec is no longer produced by CREA. Aside from that positive step, discussions with CREA are currently moving at a snail’s pace, Juaneda says. Still, there seems to be an openness among members of the CREA board to listen to the demands of the Quebec boards, which augurs well, he says. Recently two smaller boards that had previously opted out of CREA decided to rejoin the national association. Last September, the GMREB board of directors decided to remain in CREA despite a vote by members that rejected the status quo. Members were given three choices in the vote: leave CREA on January 1, 2013; postpone the decision until after the spring meeting; or remain a CREA member. The highest number (40.4 per cent) opted to leave CREA, while 31.5 per cent voted to postpone leaving CREA and 28.2 per cent chose to remain with the national association. Valuations are getting so high in Vancouver’s commercial market it is starting to affect deal flow, says a new report. RealNet Canada Inc. says capitalization rates – the implied rate of return on a property – in British Columbia have gone so low that a 13% decline in sales in the first quarter can be attributed to the drop. The lower the cap rate, the more a property is worth. RealNet said there was 217 transactions of more than $1-million in the Vancouver market in the first quarter which amounted to $1.06-billion in activity. That was sharply down from the more than $1.2-billion in activity in the fourth quarter of 2012 but still 10% above the long-term quarterly average. The only asset classes showing improved activity were office and hotel. Office sales volumes were up 114% from the previous quarter. Land investment dropped 11% from the fourth quarter. The big deal in the first quarter was British Columbia Investment Management Corp.’s purchase of 349 West Georgia Street, an entire downtown Vancouver block taking up 2,984 acres of land. The property was purchased from Canada Post for $166-million. A significant correction in the Canadian housing market in the short term is unlikely, says a new report. Housing affordability is largely unchanged in first three months of 2013 along with mortgage rates, home prices and household incomes, says Royal Bank of Canada’s Economics Research department. Home resale volumes have fallen 13% on last year, although much of the decline took place after last July’s changes to government-insured mortgage insurance rules. Exceptionally low mortgage rates have been the chief factor in keeping homeownership costs relatively affordable, according to the Housing Trends and Affordability Report. Craig Wright, senior vice-president and chief economist, RBC, says, “The Canadian housing market cooled significantly in the past year; however, there is mounting evidence that activity is no longer weakening. The RBC report calculates the proportion of pre-tax household income needed to service the costs of owning a specified category of home at going market values. A rise represents lower affordability. From January to March the measure for detached bungalows climbed 0.3% to 42.5%, still under the 44.5% reached in previous Canadian market downturns when prices fell by more than 5% across the market. The standard two-storey home index was at 48% and condominium apartment at 28.1% – both unchanged. “While affordability levels are manageable at this point, we’d be humming a very different tune if interest rates were to suddenly rise substantially. Fortunately, the likelihood of a surge in rates is slim at this stage. When interest rates eventually rise, it will be because the Canadian economy is on stronger footing, with rises in household income to offset any negative impact on affordability. Home prices have generally held up so far in 2013, thanks to predominantly balanced markets in Canada. RBC expects market activity to remain subdued this year, but there may be a “mild strengthening” as the effects of the government changes decline. Vancouver continues to be the least affordable market in the country by far, with Toronto and Montreal showing signs of affordability issues, particularly with single-family homes. RBC’s housing affordability measure for the benchmark detached bungalow in Canada’s largest cities is Vancouver 82.3% (up 0.1% from the previous quarter); Toronto 53.8% (up 0.8%); Montreal (pictured) 40.1% (up 0.6%); Ottawa 39.1% (up 0.1%); Calgary 38.7% (up 0.8%); Edmonton 30.4% (down 0.2%). Affordability across British Columbia improved slightly and fell 0.4% for bungalows and by 1.3% for two-storey homes, but is still the highest in Canada. In Alberta, the affordability index rose 0.2%, but was offset by high household incomes. Following a big all in the fourth quarter of 2012, Saskatchewan’s affordability saw the largest improvement with measures falling 1.7% for two-storey homes, 1% for bungalows and 0.3% for condominiums. Manitoba’s affordability levels rose slightly, up 0.8% for bungalows, 0.4% for condominiums and 0.2% for two-storey homes. In Ontario, measures for both bungalows and two-storey homes rose by 0.4%, while the measure for condominiums remained unchanged. Quebec bungalow affordability also rose 0.4%, with two-storey homes up 0.1% and condos falling 0.6%. The index for Atlantic Canada rose between 0.4% and 0.6%. The RBC Housing Affordability Measure, which has been compiled since 1985, is based on the costs of owning a detached bungalow (a reasonable property benchmark for the housing market in Canada) at market value. Home inspections have traditionally been for the benefit of the purchaser. Pre-inspected listings benefit all parties – purchasers, vendors and Realtors. If the home inspection is performed prior to the house being listed, all parties will be aware of the physical condition of the house before an offer is drawn. There will be no surprises after the fact. Deals will not fall through. In a buyers’ market, most houses have to be sold twice. It takes a lot of work to get a signed Agreement of Purchase and Sale. Then the home inspection is done and the purchaser wants to renegotiate. If all parties know the condition of the house prior to the offer, there is no need for renegotiation. As most real estate agents know, renegotiation is very difficult. Vendors have already mentally sold the house; purchasers are suffering buyers’ remorse. Egos, pride and frustration can muddy the already emotional waters. A vendor who pays for a home inspection will be further ahead than one who has to renegotiate. He or she may even sell the house faster. Grandview Theatre, 1730 Commercial Drive, now. Photograph by: Dan Toulgoet, Vancouver Courier. 1000 Block of Commercial Drive, 1922 VPL Accession Number: 7391. Photograph by: Photographer / Studio, Timms, Philip. 1000 Block of Commercial Drive, now. Photograph by: Dan Toulgoet, Vancouver Courier. 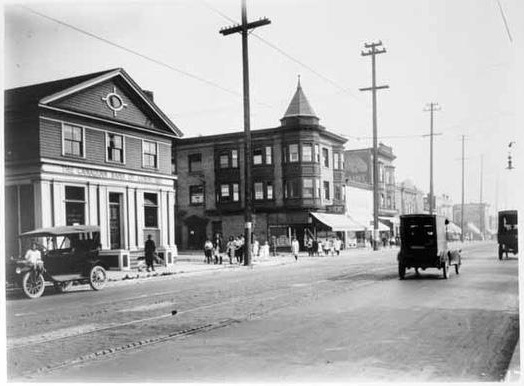 View of Commercial Drive and bank at 1800 block looking north west, 1922 VPL Accession Number: 7411. Photograph by: Photographer / Studio, Unknown. View of Commercial Drive and bank at 1800 block looking north west, now. Photograph by: Dan Toulgoet, Vancouver Courier. tracks, Commercial and Broadway, 1960. Photograph by: VPL Accession Number: 43337, Vancouver Courier. tracks, Commercial and Broadway, now. Photograph by: Dan Toulgoet, Vancouver Courier. Philip Timms’ home, 1936 VPL Accession Number: 19548. Photograph by: Photographer/Studio, Timms, Philip. hilip Timms’ home, now. Photograph by: Dan Toulgoet, Vancouver Courier. 1600 block Commercial Drive, 1920s VPL Accession Number: 7144. Photograph by: Photographer/Studio, Timms, Philip. 1600 block Commercial Drive, now. Photograph by: Dan Toulgoet, Vancouver Courier. Commercial Drive at First Avenue intersection, 1922 VPL Accession Number: 7426. Photograph by: Photographer / Studio, Unknown. 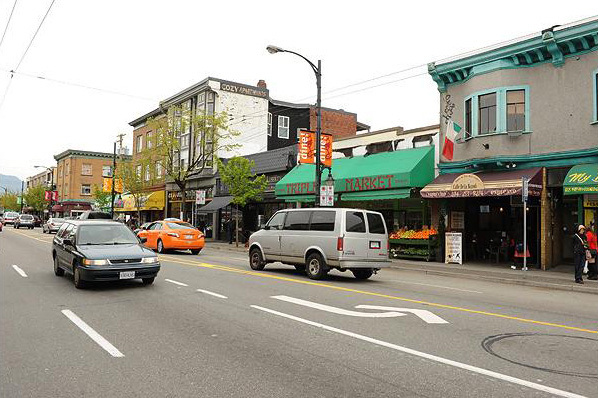 Commercial Drive at First Avenue intersection, now. Photograph by: Dan Toulgoet, Vancouver Courier. 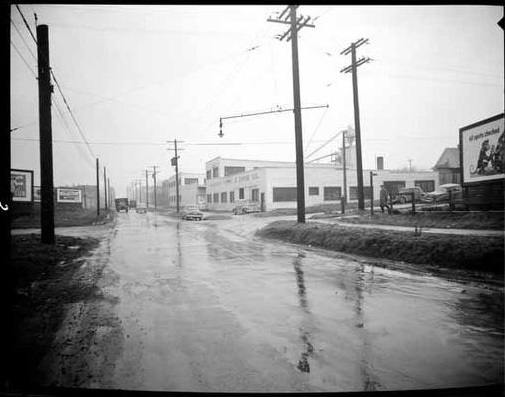 Clark Drive and Charles Street, Feb. 16, 1950 VPL Accession Number: 81150. Photograph by: Photographer / Studio, Artray. Clark Drive and Charles Street, now. Photograph by: Dan Toulgoet, Vancouver Courier. 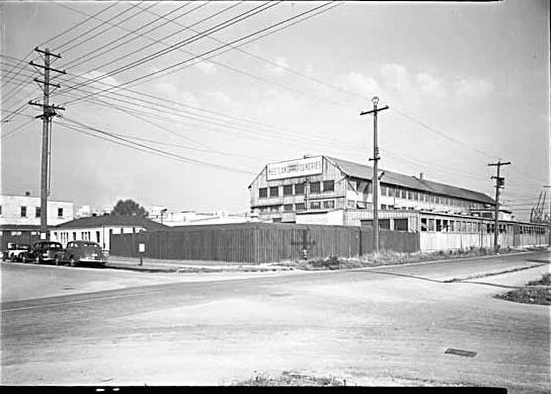 1395 Franklin, 1940s Westland Iron and Steel Foundries Limited Content: Westland Iron/Steel Foundries, 1395 Franklin. Photograph by: VPL Accession Number: 19665, Vancouver Courier. 1395 Franklin, now. Photograph by: Dan Toulgoet, Vancouver Courier. 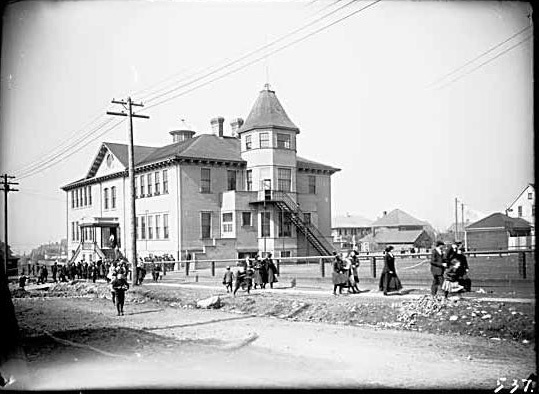 Grandview School, on East 1st near Commercial Drive,1914. VPL Accession Number: 5132. Photograph by: Photographer/Studio, Timms, Philip. Grandview School, now. Photograph by: Dan Toulgoet, Vancouver Courier. $2.95 is the longstanding cost of the popular all-day breakfast special at Bon’s Off Broadway restaurant. Photograph by: Dan Toulgoet , Vancouver Courier. 1.5: In kilometres, the distance between Grandview Highway and Venables Street, the stretch widely considered as “The Drive” despite the street continuing for several more blocks in both direction. 2: Number of unaffiliated vegetarian restaurants with nearly identical French names. The original Café Du Soleil set up shop in 1992 while the larger Café Deux Soleils down the street opened its doors a few years later. 10: Percentage of residents who are of aboriginal descent, according to the 2011 census, eight per cent higher than the city-wide average. 4: Number of nationalities represented in the name of the WISE Hall. Homesick U.K. residents first started the social club in 1957 and the acronym was chosen represent its predominantly Welsh, Irish, Scottish and English membership. 40: In degrees Celsius, the typical temperature inside a class at Bikram Yoga Commercial Drive. 2.95: Longstanding cost of the popular all-day breakfast special at Bon’s Off Broadway restaurant. 125: Number of buildings listed on the city’s heritage register. Roughly a quarter of all homes in Grandview-Woodland were built before 1946. 66: Percentage of residents who rent their homes, 14 per cent higher than the citywide average, according to the 2011 census. 1: Number of bike polo courts. The Grandview Park playing area, completed in 2011 at a cost of $90,000, is said to be the first public court in the world designed specifically for bike polo. 385: Total number of seats available between the Vancouver East Cultural Centre’s two theatres. The Cultch’s Historical Theatre has a maximum capacity of 285 (although most shows have 195 seats) and the new Vancity Culture Lab can handle up to 100 audience members. 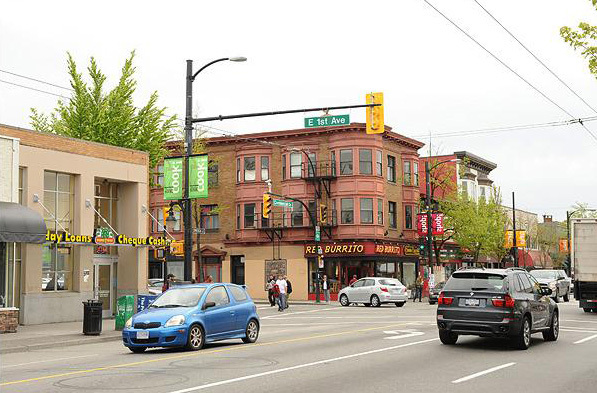 It’s officially known as Grandview-Woodland, but most Vancouverites refer to the neighbourhood that is bounded by Broadway to the south, Burrard Inlet to the north, Clark Drive to the west and to Nanaimo Street to the east as the Commercial Drive area. 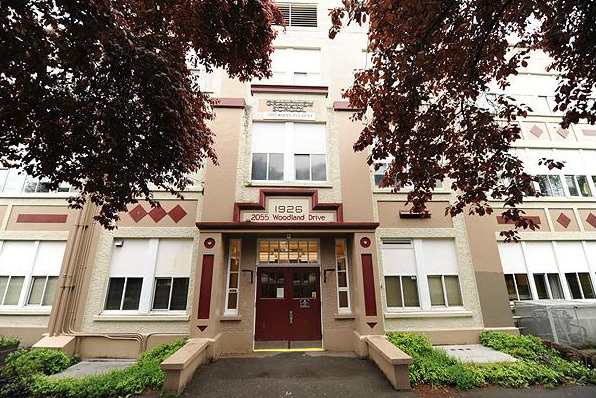 It’s one of Vancouver’s most diverse neighbourhoods in terms of people, housing and land use and also one of its oldest. The 448-hectare East Side neighbourhood is home to 27,297 people, according to the 2011 census, which is a decline of about 900 people from six years earlier. Similar to the rest of the city, the largest age group is 30 to 44 year olds. More than two-thirds of the area residents are renters living in low-rise apartment buildings whose median household income is $35,342 (the city average is $47,299). About 10 per cent of the population self-identify as being aboriginal. 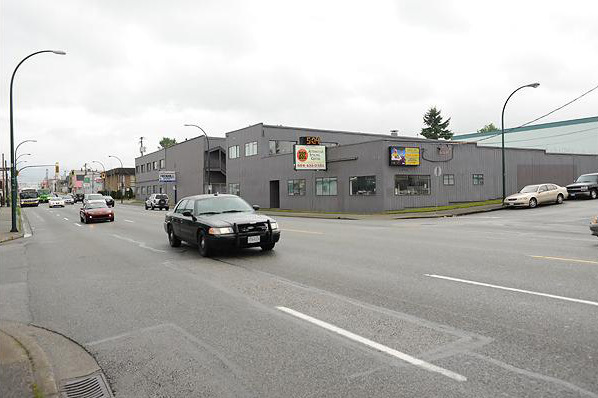 First-time visitors to the neighbourhood likely get a good sense that Grandview-Woodland is a little different thanks to Ken Lum’s famous “East Van” cross at Clark Drive and Great Northern Way. And while there is no poodle on a pole à la Main Street, there is an art installation more symbolic of the area – a giant blue cappuccino cup in Grandview Park (albeit one that’s now a bit chipped and used as a garbage receptacle). Indeed, “the Drive,” which is the heart of the area, is home to such a concentration of cafes it’s a marvel they can all stay in business. But each is well-patronized by its own unique clientele that makes café hopping akin to a round-the-world trip without the need for a passport or different currency. But it’s not all la dolce vita sipping espressos and cappuccinos. Because demand for new development is growing, city staff are working on an official plan to ensure that future growth in Grandview-Woodland meets the needs of the community. The area has been the centre of many protests, including one demonstration three years ago against the upgrading of Grandview Park. 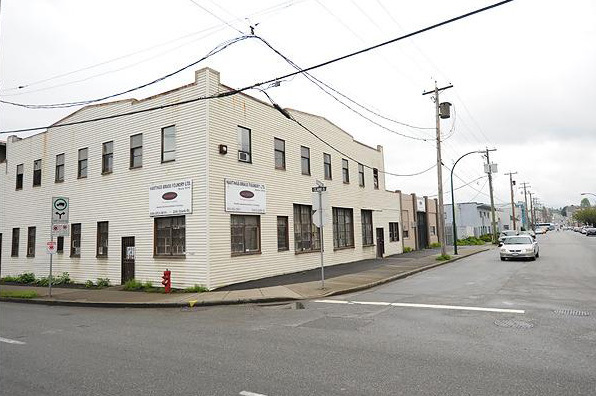 In recent weeks, a house under construction on East First Avenue near Victoria Drive was the target of an arsonist while some businesses have been vandalized by so-called anarchists protesting gentrification of the area. Stay tuned. You are currently browsing the Les Twarog Vancouver Real Estate and Condo Blog blog archives for May, 2013.